True words said by the Joel Fuhrman. This time lets know about the 5 nuts, which you should consume and their health benefits. 1.It has a high fibers presence in it which helps to remove toxin from our body and easy digestion. It protects us from certain infections, bacterial growth and discomfort from bloating. 2.Raisins are the natural remedies for acidosis because they are rich in Potassium and Magnesium. 3.It has presence of many members of Vitamin B which helps in the formation of new blood cells and cure anemia. 4.It has a high copper content which helps in the production of red blood cells. 5.It has high content of calcium, which promote bone growth and strength. 6.Boron, Oleanolic acid and phytochemicals present in Raisin helps in prevention gums problems and stronger our teeth. 7.Catechins and Polyphenolic phytonutrients (Antioxidants) prevent damage from radical and cancer. 9.Raisins have strong germicidal properties which cure psoriasis and acne. 10.Vitamin C present in Raisin helps in gaining thick, shiny and healthy hairs. 11.It helps us in getting good sleep due to presence of Iron. 12.The High presence of potassium, fibers, polyphenols, phenolic acid, tannins, and antioxidants help in controlling cholesterol levels. Turkey is the largest producer of raisins along with The United States, Iran and Greece. In India Raisin are known as “kishmish”. 1.Most of the world supply of Raisin is grown in California. 2.30 April is celebrated as national raisins day. 3.Finest Raisin is considered to be produced from Spain. 4.Fresno is the Raisin capital of the world. 5.Cool storage is the best way to keep Raisin. 3.Just as plain as it is. 4.By adding in the Cookies, muffin, cakes and many other desert. Dates are very sweet, smooth, glossy and little hard oval- cylindrical dry fruits. Dates are the fruits from the date palm tree which dried through sun drying or through specialised Dehydrators. 1.It have a high presence of several Antioxidants, Vitamin and Minerals. 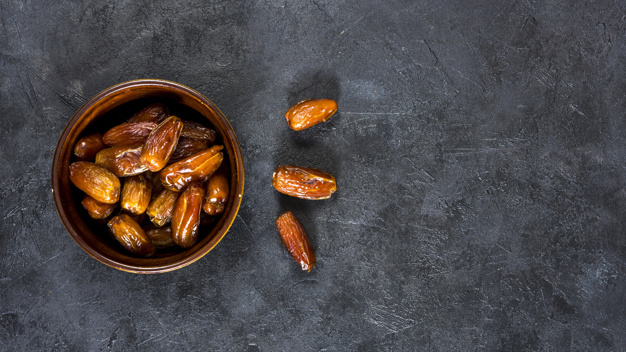 2.Dates are a good source of energy because if the high presence of glucose, fructose, and sucrose. 3.It improves brain health as it prevents oxidative stress and inflammation in the brain. 5.It prevents night blindness and keeps our eyes healthy because it has a high source of Vitamin A. 6.It is a good source of fibers and helps in digestion, weight management, healthy bowel management, and treat diseases like gastroesophageal reflux disease (GERD), diverticulitis and hemorrhoids. 7.Good source of calcium, phosphorus, potassium, calcium, Magnesium, selenium, manganese, copper, which promote strong bones, formation of red blood cells, relief from constipation and prevent disease like anemia. The Largest producer of dates in the world is Egypt along with other countries like Iran, Saudi Arabia and Iraq. In India dates are known as “khajoor”. In Egypt it is known “tawarikh”. 1.You can simply eat dates by removing the pit. 2.You can eat the in oatmeal. 3.You can also eat them by adding them into cookies, muffin and desert. 4.You can mix them in your juice. 5.You can eat them with your fruit salad. 2.Dates are the local food of Northern and Middle East Africa. 4.According to Islamic tradition, the date tree is the tree of life in the Garden of Eden. 1.It has rich amino acid L-arginine present in it which promote healthy blood vessels. 2.It has a rich presence of monounsaturated and polyunsaturated fats, which promotes good heart health. 3.It stabilized blood glucose level Due to the presence of Carbohydrates, protein, fat and fiber. 4.Lutein and zeaxanthin are present in high level in pistachio which is good for our eyes. 5.The Pistachio has high fiber which is good for stomach health. 6.The Pistachio has high fiber which is good for stomach health. 7.Pistachio contains carotenoid antioxidants, which prevent muscular disease. 8.It has a good source of copper, which help in absorption iron from food. 9.It is good for skin health because of presence of vitamins A, B6, C, E, and K.
10.The Pistachio has anti inflammatory property due to Vitamin A. 11.It maintains healthy nervous system due to Vitamin B6 and also boost the immune system. In India pistachio is known as “pista”. 1.Most people love to devour the salty state of the nutshell. You can remove the shell and eat the fleshy part simply. 2.You can even eat it with your oatmeal, fruit salad, juice, and many desserts. 1.It has more than 30 different vitamins, minerals and phytonutrients. 2.It has more protein than eggs. 3.Every Year 26 February is celebrated as a National Pistachio Day. 4.Pistachio is also known as green almond. 5.Pistachio in China is known as happy nuts. 6.Pistachio is related to the mango. 7.We should eat 5 to 7 pistachio every day. 1.Vitamin E Present in almonds prevents radical damage, and chronic disease. 2.It is good during pregnancy because it reduces risk of birth defects due to presence of folic acid. It is enough to keep baby and mother healthy. 3.It is rich in fibers which prevent constipation, problems related to digestion and regulates bowel movement. 4.Almonds are the best source of energy Due to the presence of manganese, copper, and Riboflavin. It increases our body metabolism. 5.Linoleic and linolenic acids present in almond which is excellent for reducing inflammation all over the body, reduce cholesterol and promote healthy skin and hair. 6.Almond are the richest source of Vitamin, minerals and many nutrition, which is good for the human brain. Riboflavin, and L-carnitine helps in increase in brain activity. 7.Almonds help in improving the bone health. The largest producer of almonds is the United States followed by countries like Spain, Iran and Morocco. In India almond are known as “baadam”. In Spain it is called “Almendra”. 1.Soak 8 to 10 almonds overnight and in the morning, eat them after peeling the skin off. 2.You can add them in milk after making a paste. 3.You can add them in fruit salad, sweets and different types of desert. 4.Almond oil is used for making food. 1.Almonds can quench your thirst because of being crunchiest dry fruits. 2.It has long storage life. 3.India is a country where almonds are considered as the brain food. 4.Almonds are the seeds not nuts. 5.Almonds have 90% of unsaturated fats. 2.It is a good source of copper and phosphorus, which maintain bone health. 3.It has an alpha-linolenic acid, eicosapentaenoic acid, docosahexaenoic acid, iodine and selenium, which is good for brain health and boost our mood. 4.Walnuts are ranked 2nd when it comes to the presence of antioxidants. It has quinone juglone, the tannin tellimagrandin, and the flavonol morin which prevents many chronic diseases and keeps our liver healthy. 5.It contains manganese, copper, potassium, calcium, iron, magnesium, zinc, and selenium, which increases metabolism and growth of the body. 6.It contains polyunsaturated and monounsaturated fats, which prevent and control diabetes. 7.It is a super dry fruit which cure constipation, promote easy digestion, and detoxification of the body. 8.1 to 2 walnuts per day reduces inflammation in the body. 9.It is a good source of Vitamin E for healthy skin and hair. 10.It boosts our immune system. 11.Vitamin B Present in Walnuts is good for pregnant women as it promotes fetal growth. 12.It is good for regulation sleep disorder as this dry fruit makes melatonin. The Largest producer of Walnuts is China followed by the United States, European Union, Ukraine, and Chile. In India walnut is known are “akhrot”. 1.You can eat Walnuts simply. 4.You can add or mix them with your dessert. 1.Walnuts are known as a powerhouse. 3.It helps us to keep our mind sharp. 4.Walnuts are the most nutritious among all the nuts. Dry fruits are loaded with the lots of Vitamins, Minerals, Nutrition’s, and antioxidants. Their health benefits are unlimited. So, this 2019 include dry fruits in your diet plan and be healthy.